- English is now the default GUI/skin language. 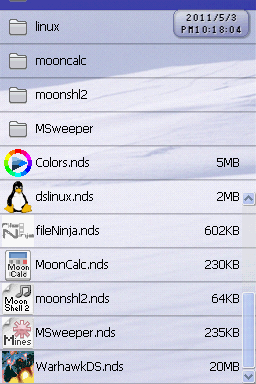 - Check the "Misc ToolsExtras" folder to add extra functionality to MoonShell 2. 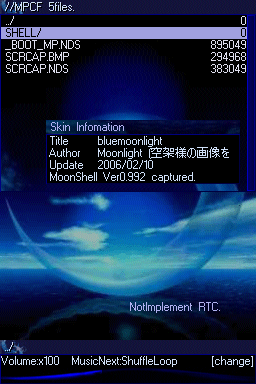 - The "Extras" folder also contains a version of GBA ExpLoader specially adapted for MoonShell2 by Rudolph. View the Readme in that folder for details. 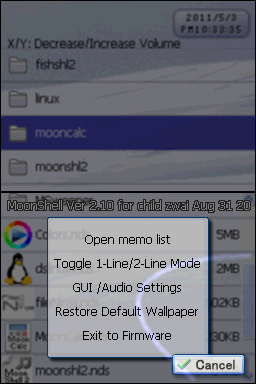 - Soft-reset files for DSLink and R4 included in the "moonshl2resetmse" folder (also by Rudolph). If anyone knows how to create soft-reset files for other flashcarts, please submit them for inclusion into this release. You will, of course, be credited. - You can make screen captures of the GUI by holding down SELECT for 3 seconds. MoonShell 2 will freeze afterwards, but this is normal. Simply shut down and reboot. 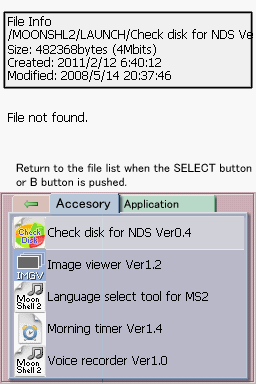 The screencaps will be found on the root of your MicroSD card. If you take multiple screencaps, a number will be appended to the image filenames in sequential order.